WATERVILLE -- The January thaw might have melted most of the snow at Quarry Road Recreation Area, but Mother Nature has no monopoly on snow-making. 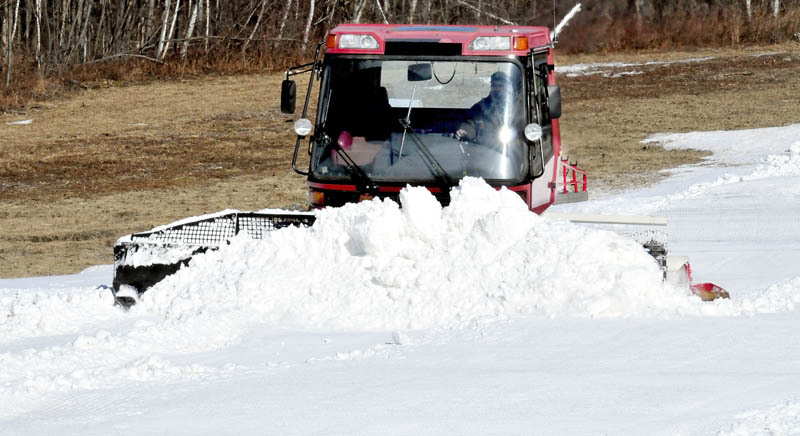 WATERVILLE — The January thaw might have melted most of the snow at Quarry Road Recreation Area, but Mother Nature has no monopoly on snow-making. Snow-making machines have been replenishing snow at the facility this week, making it once again suitable for cross-country skiing. “We’ll have two kilometers of groomed trails,” Parks & Recreation Director Matt Skehan said Wednesday. He said the trail is now about 20 feet wide. More snow will be made from noon to 4 p.m. today, Skehan said. A base of 8 to 12 inches of machine-made snow survived the January thaw, and another 12 to 14 inches of new snow will be added to it and groomed, Skehan said. More than a half-dozen school ski teams are expected to compete this coming weekend in events organized by the Central Maine Ski Club, according to Skehan. Fees will be charged for the events, he said. Meanwhile, the ski club is planning to host a paintball biathlon at the site Feb. 23 and the Parks & Recreation Department hopes to piggyback on that event to offer some activities that would have been held at the city’s annual winter carnival, which was canceled recently because of warm temperatures and a lack of snow. Skehan said a tree maze and a bonfire would be included in the activities Feb. 23.